Description: Innovation never looked so good with this unique lighting fixture that integrates ceiling fan technology. Enjoy beautiful light diffused through Silver Mica, while gentle breezes are produced by the 30"" fan spinning quietly in the center. A majestic Elk meanders through a striking stand of tall pine trees, which along with the frame and hardware, are finished in Oil Rubbed Bronze. The fixture features eight inner lights for a decorative effect. 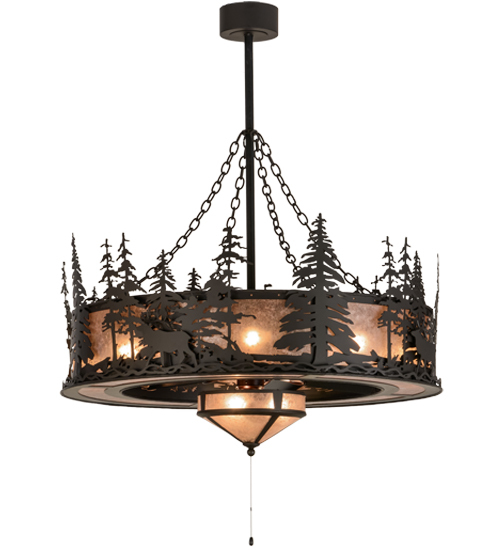 Handcrafted in Yorkville, NY by Meyda artisans at the foothills of the Adirondack Mountains, this energy saving Chandel-Air pulls hot air up and keeps the space cool in the summer, and reversed in the winter to push down hot air and maintain warmth.